Three teenagers were killed and two seriously hurt when their car collided with a bendy bus in Charlton, south-east London, on New Year's Day. Police said car driver Joe Wallis, 18, from Plumstead, Georgina Fox, 16, from Eltham, and Amy Curran, 15, from Blackfen, died at the scene. The two other passengers - both 17 - were cut free and taken to hospital. Police said the five were in a car that collided with a bus in Little Heath near the junction with Cemetery Lane. The accident happened at about 0630 GMT on Tuesday. One of those rescued, a boy, was taken to Queen Elizabeth Hospital where he is now in a stable condition with minor injuries. A rescued girl was taken to the Royal London Hospital. She suffered multiple fractures, said a police spokesman. 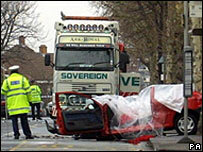 Transport for London said the number 453 bus was out of service at the time of the crash and the driver was unharmed. A spokesman said: "As the bus was out of service, no passengers were on board. "We understand that some of the car's passengers were killed and our thoughts are with their families and friends." Local resident Eddie McCann said repeated calls for speed cameras, at what he described as an accident blackspot, had gone unheeded. Mr McCann, 38, said there had been numerous accidents on the road. He said: "I've lost count of the number of times I've run out of my house in my boxer shorts to pull people out of cars."